If we had to choose companions for a trip through Patagonia, we’d surely select the other members of our team. Why? We like to travel with those who know the region; who are always positive, attentive to others’ needs; and above all, fun people with whom we can share relaxed moments. This is why we say that the real heart of Dirty Bikes is our team of people, our pride. Each member, whatever their specialty may be, knows how to help you achieve the trip of your dreams. From the beginning, Dirty Bikes stood out because of the extraordinary service offered, as a result of the energy and spirit of Anibal Marasi, its founder. With time, Anibal was able to develop a team that adopted the Dirty Bikes philosophy, with each member bringing their particular set of knowledge and experience to the mix. We know the importance of attention to every detail, which is why we can offer extraordinary trips. This is not learned through a training manual; rather, it is an instinctive awareness that defines the nature of our team. Anibal Marasi and Javier Lardone are dedicated to the design and organization of our trips. They research, travel, and try out everything until they have crafted trips that combine only the most beautiful places with cultural and historical elements, great circuits for cycling and other outdoors activities, and excellent hotels and cuisine. It’s hard to know how many miles Anibal has traveled through Patagonia. But we can assure you that the distance logged is easily sufficient enough to guarantee you an ideal trip. No one knows as much about our Patagonian travel routes as our leader. Originally from Buenos Aires, Argentina’s capital, Anibal’s life changed when he moved to Bariloche. He is the father of three children born in Patagonia, and today balances his love for family with his passion for traveling through our region. His great experience in outdoors sports, particularly adventure races, has taken him to the most remote parts of Patagonia. This experience allows him deep sensory awareness and an ability to anticipate the needs of each one of our guests during our trips. Anibal still leads or participates in most of our adventures. He also welcomes each one of our guests upon arrival in Bariloche, where you will surely get the chance to have a chat with him. Javier was born and raised in different parts of the Argentine Patagonia. His father’s work took him and his family to the United States, Norway, and Venezuela, among other countries. After studying International Business in Texas, he worked for different American companies throughout Latin America. These experiences have made him a real “man of the world,” and forged his passion for travel. 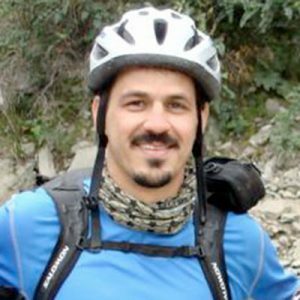 Javier journeyed for almost three years throughout Latin American, doing everything outdoors – climbing, mountaneering, mountain biking, and on a variety of adventure expeditions. He worked as a scuba diving guide in Brazil. He explored jungles in Central America and marveled at the ancient Mayan ruins in the Yucatan and Guatemala. He lived on the Mexican Pacific coast, where he surfed and dived. And he crossed Argentina, Chile, Uruguay, and Brazil. However, it was in the Patagonia where he found his place in the world. He bought a bicycle from Anibal, who gave him advice for a 2000km solo trip throughout southern Chile and Argentina. 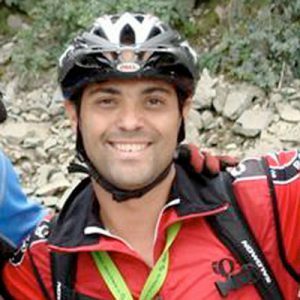 Anibal’s experience and knowledge were of great help, and in the end defined his future with the Dirty Bikes team.